Spider characters from A Song of Ice and Fire, Harry Potter, The Lord of the Rings, The Silmarillion, H. P. Lovecraft’s The Call of Cthulhu and the children’s favourite Charlotte’s Web and Little Miss Spider each gave a name to a new small cave-dwelling six-eyed spider inhabiting northern Brazil. Discovered in iron caves across the state of Pará, northern Brazil, the new species belong to the same Neotropical genus Ochyrocera. They are described in a new research article published in the open access journal ZooKeys by Dr Antonio Brescovit, Dr Igor Cizauskas and Leandro Mota – all affiliated with Instituto Butantan, Sao Paulo. Interestingly, while all seven previously unknown species prefer staying in the shadows underground, none of them has the adaptations characteristic for exclusively cave-dwelling organisms, such as loss of pigmentation and reduced or missing eyes. They are classified as edaphic troglophile species, which means that they are capable of completing their life cycle away from sunlight, but are not bound to the deepest recesses. 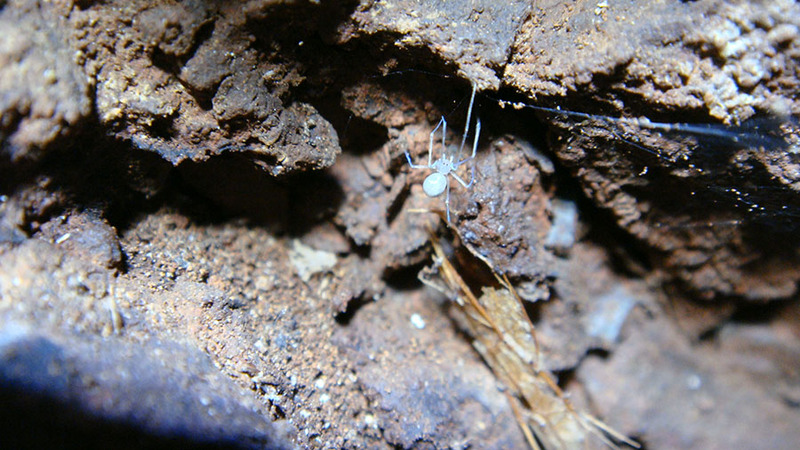 Often crawling near the surface, they can even be spotted outside the caves. To describe the species, the scientists collected about 2,000 adult specimens following a 5-year series of field collection trips. The list of ‘fantasy’ spiders begins with Ochyrocera varys named after Lord Varys from George R. R. Martin’s book series A Song of Ice and Fire. Lord Varys is also known as the Spider because of his manipulative skills and ability to ‘weave’ and command his networks of eyes-and-ears across two continents. The name of Ochyrocera atlachnacha refers to the Spider God Atlach-Nacha from the universe created by H. P. Lovecraft. Atlach-Nacha is a giant spider with a human-like face which lives in the caves beneath a mountain and spins a web believed to link the world with the Dreamlands. Two species are named after spider characters from the classic works by J. R. R. Tolkien. Ochyrocera laracna is a species named after the well-known giant spider Laracna (Shelob in English) who attacks main characters Frodo and Sam on their way to Mordor in The Lord of the Rings’ second volume – The Two Towers. On the other hand, the Brazilian spider’s sibling – Ochyrocera ungoliant – is linked to Laracna’s mother. Ungoliant appears in Tolkien’s book The Silmarillion, whose events take place prior to those of The Lord of the Rings’ second volume The Two Towers. According to the story, Ungoliant translates to Dark Spider in Elvish. Another staple in the 20th-century fantasy literature, the Harry Potter series, written by J. K. Rowling, also enjoys the attention of the researchers. The species Ochyrocera aragogue is an explicit reference to the talking Aragog, who lives in the dark recesses of the Forbidden Forest. In the second volume of the series, Harry Potter and the Chamber of Secrets, he confronts Harry Potter and Ron Weasley. The Ochyrocera charlotte species refers to Charlotte, the spider from E. B. White’s classic Charlotte’s Web who befriends the main character – Wilbur the pig. It is highly likely that there are many species and populations of this group of spiders yet to be discovered in the Neotropics, since the lack of previous studies in the region. However, the area and its biodiversity are impacted by mining.